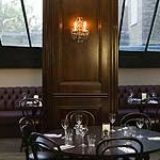 The Hand and Flower offers a varied menu of British fare alongside an extensive drinks list. 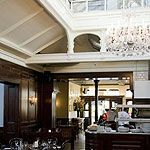 The ever changing menu typically includes dishes such as linguine with chargrilled vegetables, salmon and prawn risotto or 28 day dry aged ribeye steak. In clement weather enjoy alfresco dining in the picturesque terraced area. 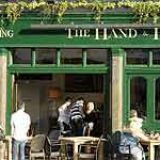 Do you work at The Hand and Flower? What did you think of The Hand and Flower? I've been here a few times and have always been thrilled with both the service and the quality of food on offer!! I have used their fixed menu a few times which is amazing value given you can have a large rib eye steak in the bargain as well as a lovely starter... For me the roasts on a sunday are the winner...good quality meat and crispy potatoes (warning goose fat may be used)...plus a tasty rich gravy which you can tell is home made! I especially like the open plan kitchen area and the attention to detail such as cucumber slices in jugs of water...interesting and it works well to quench the thirst! overall top notch and i will be taking me GF here for her birthday next week! Everything here is divine - the food, the friendly and attentive staff. 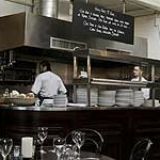 Last time my partner and I were there, we stopped at the open kitchen to complement the chefs and were met with two lovely, modest chefs who were thirlled we loved their food. They have a great offer on at the moment - Mon-Thurs 2 courses for £15 - please please take advantage of this. Try out the lamb, or the sole, of the steak - all amazing. I love this place! Just had the most amazing meal in The Hand Flower!! I had goats cheese salad with walnuts to start, which was lovely but also tasted my friends starters of mussels & blue cheese fritters! YUM. Then had roast lamb with roast potatoes & veg. When we mentioned there was no yorkshire pudding our waitress went & got some for us. I finished off with an Irish coffee, My friend had the orange pudding which was delicious. Will definitely be going back!! Tried this for the first time yesterday with our four year old in tow, as we live just close by. I had bad memories of the establishment under previous ownership, but now the place if first class. The ambiance is fresh and attractive; great selection of beers too. Best of all was the excellent fresh food. 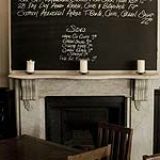 It's great to have a really good gastro pub in the area now. Give it a try...you will be very happy you did!